Senator Susan Collins of Maine meets with Brett Kavanaugh on Capitol Hill on Aug. 21. Monday night in the East Room, President Trump paraded the newly installed Justice Brett Kavanaugh like a political Super Bowl trophy, turning his accession to our highest court into a Republican pep rally. Unsurprisingly, Kavanaugh joined in, praising his GOP senatorial sponsors as his fellow justices watched, captives in Trump’s partisan tableau. It was sadly predictable. As the nomination hung in the balance, I wrote that the vote posed a test of character for four undecided senators — Heidi Heitkamp, Lisa Murkowski, Joe Manchin, and Susan Collins. In failing it, one further degraded the court. Kavanaugh’s own character was clear. To counter credible allegations of long-ago sexual assault, he unleashed a shockingly intemperate and belligerent attack on his opponents that revealed him to be the partisan political operative they correctly perceived; used Fox News and The Wall Street Journal to rally GOP support; and interrupted and insulted Democratic members of the Senate Judiciary Committee. 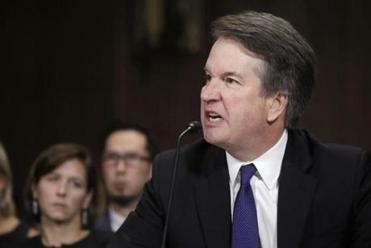 Desperate, he lied repeatedly and transparently about his immersion in the teenage drinking culture that engendered the alleged assault, and about crucial aspects of his service under George W. Bush. His dishonesty and injudiciousness, disqualifying in any judge, sharpened fears that Donald Trump had appointed Kavanaugh to protect himself from the rule of law itself. Arousing his base, Trump ridiculed Kavanaugh’s accuser, Christine Blasey Ford, drawing laughter that evoked the laughter that Ford recalled Kavanaugh sharing with a friend who witnessed the alleged assault. With calculated misogyny, Trump conjured the real “victims”: embattled men — like Trump himself, forever self-pitying and besieged — facing accusations lodged by predatory women. Like a Greek tragedy, the controversy over Brett Kavanaugh comes down to character. In this visceral setting, the four senators defined themselves. First, the Democrat Heitkamp of North Dakota — facing an uphill fight for reelection in which opposing Kavanaugh was likely fatal. Voting no, she cited her life experience as a woman, her sympathy for victims, and her doubts about Kavanaugh’s temperament. The Republican Murkowski of Alaska followed, expressing concern “about the credibility and integrity of our institutions.” Facing his own reelection battle, Democrat Manchin of West Virginia dithered, compelling Collins to cast the crucial vote, then immediately announced his decision to confirm. Collins labeled Kavanaugh an “exemplary public servant, judge, teacher, coach, husband, and father” — serenely ignoring the intemperance and dishonesty that suffused his testimony. No worries: She had consulted – drumrolls, please – Condoleezza Rice, another mediocre careerist who rose by providing cover for her party’s sins. Assiduously, Collins airbrushed Kavanaugh’s fervent advocacy for protecting presidents from legal process or criminal prosecution. She vehemently accused groups opposing Kavanaugh of distortions and dishonesty, completely erasing a vituperative multimillion-dollar media blitz on his behalf by business interests bent on securing a compliant court — and which specifically targeted the courageous Heitkamp. Risibly, Collins stated her confidence that this avatar of the Federalist Society — whose leader views abortion as murder — would protect Roe v. Wade from evisceration. After all, “I asked the judge . . . whether he had made any commitments . . . to the Federalist Society or any outside group on how he would decide cases.” What answer, one wonders, did she expect to a question so foolish? Most disgraceful was her dismissal of charges of sexual assault. With rank opportunism, she began by denouncing those forwarded by the radioactive ambulance chaser Michael Avenatti. She then resorted to the GOP’s most pernicious and condescending degradation of Ford and, by implication, victims fortified by the #MeToo movement: that despite Ford’s “100 percent” certainty that her assailant was Kavanaugh, the attacker must have been someone else. Encapsulating her “empathy” for the woman she conveniently chose to disbelieve, Collins then attacked the nameless people — implicitly Democrats — who leaked Ford’s story. Never mind the Republicans who mocked her. Preposterously, Collins ended: “[M]y fervent hope is that Brett Kavanaugh will work to lessen the divisions in the Supreme Court so that we have far fewer 5-to-4 decisions.” But securing such decisions was precisely why the GOP deep-sixed Merrick Garland. Here, indeed, was a case of mistaken identity: Senator Pangloss had confused Kavanaugh with the Tooth Fairy. What of Collins herself? By avoiding a primary challenge in 2020, she ensured a well-funded Democratic challenger — possibly another female African-American foreign policy figure named Rice: Susan. The one with gumption. 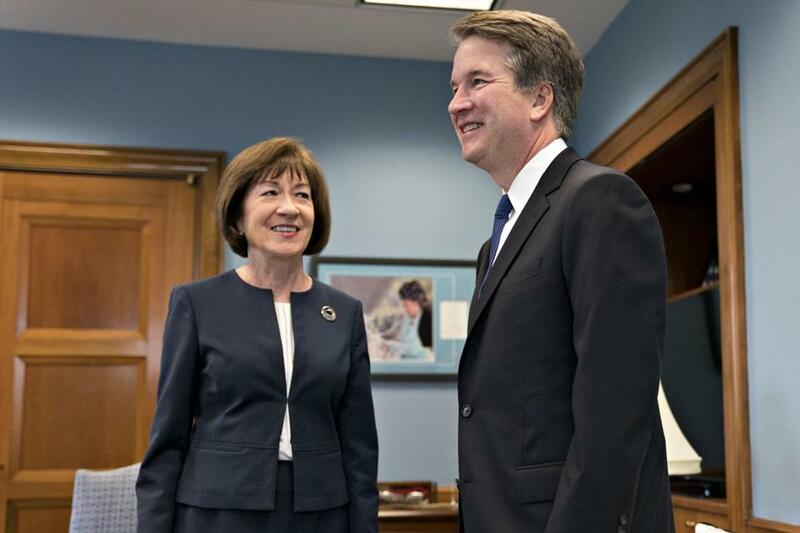 Whatever transpires, Collins has sealed her legacy – a corrupted confirmation process for a politicized court leeched of credibility.